1- Open the interface Page of the device, simply dial #126# from the phone connected to your GULFSIP device and you should hear the IP of the device. -Line Number : GULFSIP number. -Register Password: GULFSIP number password. 5- From the side menu , Click on Reboot , then click on Reboot . 8- From the side menu , Click on Reboot , then click on Reboot . You can set call forward rules to forward incoming calls to any other GULFSIP number. - All forward: Turn on to forward all incoming calls. - Busy Forward: Turn on to forward calls when your line is busy. - No Answer Forward: Turn on to forward calls in case of no answer. - Set Numbers: Set the number you wish to forward calls to in the corresponding forward rule that you have already turned on . The DND (Don’t Disturb) feature prevents calls from ringing , and gives the caller a message which is device is switched off. - Always : Turn on to prevent all incoming calls. A way of letting you know that someone else is calling , when you are using your telephone by a tone , and allows switching between calls. You can use FAX with your GULFSIP devices, but you will need to have an internet speed of at least 1MB or higher, a few settings on your GULFSIP hardware device and then connect your FAX with the “Phone” port in your GULFSIP devices . After setting the FAX you can send to any GULFSIP number or international number if you have balance in your GULFSIP number . •One way call “Can not hear the other side” & call disconnects. • Make sure that your internet connection is working well and stable, also test the internet cable on your PC (Make sure that any wireless connection on the PC is turned off while testing the cable). 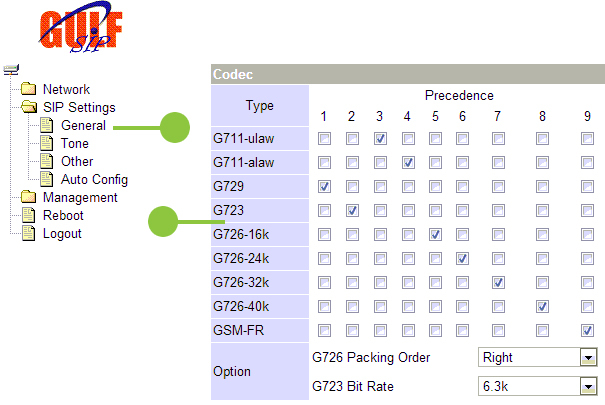 • Check your wire connection for your GULFSIP device model as shown in connection page. • If your internet router is multi-port, change the socket used from router side. • Restart your internet router and GULFSIP device for five minutes. • Dial #126# you should hear the IP address of the device, if you hear 0.0.0.0 then that means there is a problem with the internet cable or internet router. •Change port by dialing #1276000# from the phone connected to the GULFSIP device, then hang up. • Dial #122# you should hear your GULFSIP number. If you hear 1001 or nothing , that means that your device has been reset and needs configuration. 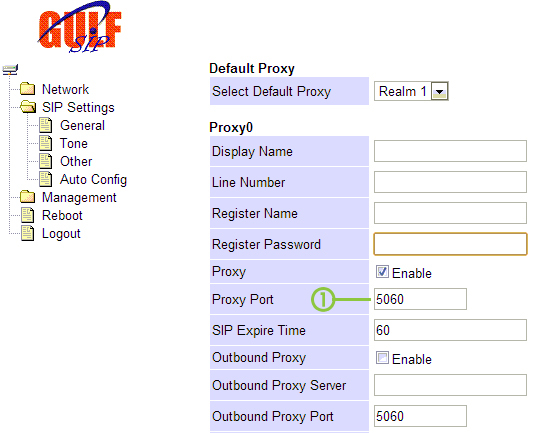 If you have the GULFSIP number & password ,you can follow the configuration steps as shown in configuration page. • Change phone kit and phone wire and make sure that phone wire is installed correctly in the GULFSIP device. • Restart both router and GULFSIP device. • Put the power adapter in a socket in the wall direct, also make sure that the power adapter used is correct values (output) as shown in connection page. Note: If after making a reset to the GULFSIP device, you still don’t hear anything, then that might mean there is a problem with you power adapter. You can try to get new one same specification as shown in connection page or contact our customer service. • Restart both router and GULFSIP device . • Change port by dialing #1276000# from the phone connected to the GULFSIP device, then hang up. • Contact your internet service provider (ISP) and make sure that firewall is turned off on your internet router. • Change port by dialing #1276000# from the phone connected to the GULFSIP device then hang up. • Check your internet speed by making a speed test. -Use G.723 for low internet speed. -Use G.729 for medium internet speed. -Use PCMU & PCMA for high internet speed.